The International Cocoa Initiative (ICI) says it has put several measures in place to help tackle child labour in cocoa-producing communities in Ghana and Cote d’Ivoire. According to Nick Weatherill, Executive Director for ICI, child labour was prevalent in cocoa-growing communities in Ghana and Cote d’Ivoire, which has affected the education of children. Mr. Weatherill, who spoke to the media at a stakeholders’ conference in Accra on Monday, on the theme, ‘Working together: linking cocoa-growing communities, supply-chains and national policies,’ said though Ghana has made great strides in improving access to education at the primary level, more efforts must be made. “With that prevalent in mind, we brought together all who have a role to play in thinking outside of the box to come up with new ways of working and putting them into place so that we could make progress to tackle a problem that is still a challenge in the sector,” he said. ICI is a multi-stakeholder initiative which has important representation from different stakeholder groups, civil society, unions, chocolate and cocoa industry, among others. Avril Kudzi, ICI Ghana National Coordinator, admitted that despite the progress Ghana has made in child protection and child labour eradication, there were still challenges in terms of getting enough teachers to rural cocoa producing communities and access to education for older age group of kids who often fell victim to more hazardous labour activities on farms. She said as a result ICI has rolled out a number of interventions to help improve the situation. “Part of our interventions is establishing and building the capacity of community members who we call the Community Child Protection Committee (CCPC). These individuals in the community will nominate, then they will form a committee, we empower, train and equip them, then they go from house-to-house, identify the households, do awareness raising, check on children who are not in school. “This Protective Cocoa Communities Framework (PCCF) is also a tool we use as a baseline and then throughout our intervention in the communities we continue to administer the PCCF to try and gauge the level of protectiveness,” she said. 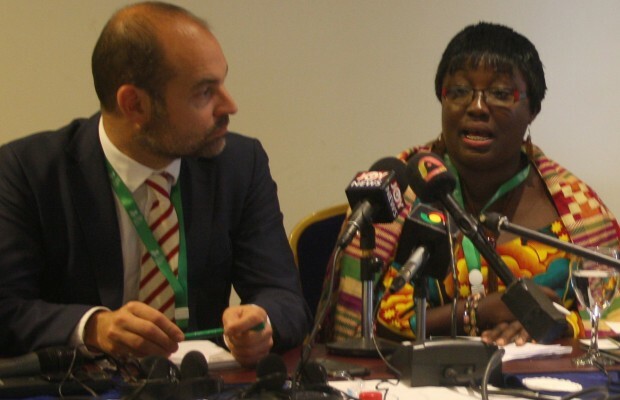 She said as part of measures to motivate teachers to admit classes frequently, ICI was working with cocoa-producing communities to provide teachers’ accommodation.